Behind our house was a tall old cedar tree whose branches concealed nests of morning doves and brushed against our bedroom window when the wind blew. This “leaf” was made with one of its boughs. 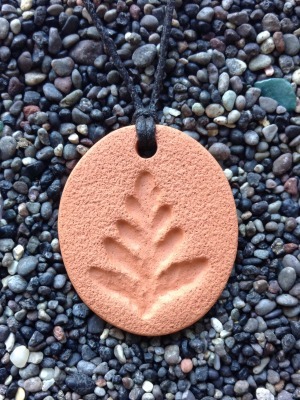 The Cedar Pendant measures 3.25 cm by 3.75 cm (1 ¼ by 1 ½ in).